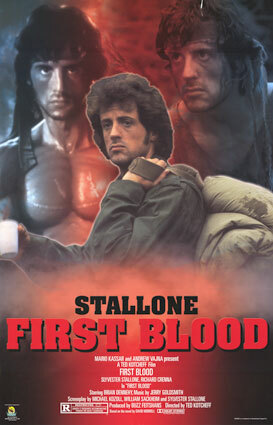 Spoiler level: First Blood is as old as me; if you haven’t seen it yet, tough. I love this poster. I love the red mist, and the way they etched out Sylvester Stallone’s giant cake hair and gave it an outer glow. And then, because that would have been too subtle, added two more, progressively madder, Sylvester Stallones in the background. Rambo: First Two Clones. Author ProjectJenniferPosted on September 25, 2012 February 20, 2016 Categories Film, Movies, ReviewsTags Brian Dennehy, Colonel Sam Trautman, First Blood book, Frankenstein, Korean War, movie, Rambo: First Blood, review, Richard Crenna, Sheriff Will Teasle, Sylvester Stallone, Vietnam WarLeave a comment on They drew first blood, not me.